Lahore: The house arrest of Mumbai terror attack mastermind Hafiz Saeed has been extended by another month by authorities in Pakistan's Punjab province, saying his activities pose a threat to the peace and tranquillity in the country. Saeed, the Jamaat-ud-Dawa (JuD) chief, has been under house arrest since 31 January this year. 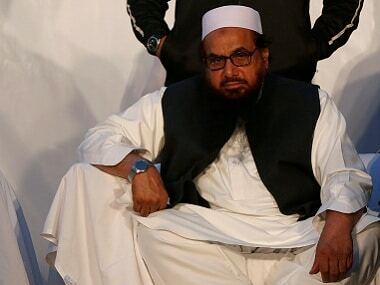 File image of Hafiz Saeed. Reuters. The Punjab Home Department on Tuesday issued an order extending the house arrest of Saeed and his four aides — Abdullah Ubaid, Malik Zafar Iqbal, Abdul Rehman Abid and Qazi Kashif Hussain — for another 30 days with effect from 25 September. The previous order to extend his house arrest was issued on 28 July. On January 31, Saeed and four others were put under house arrest by the Punjab government for 90 days under the Anti-Terrorism Act 1997. In its latest order, the Punjab Home Department said,"...Jamaat-ud-Dawah and Falah-e-Insaniat have planned to spread chaos in the country on their expected release. They have planned to make demonstrations under the leadership of Saeed. He will be portrayed as a hero and his acts will be glorified." "Transport is being arranged, arms are also being collected for a show of force and for use, if need to be, against the personnel of law enforcement agencies. Funds are also being used collected for the purpose. The liberty of Saeed is a continuous threat to the peace and tranquillity. Further recommendation for his detention is in the interest of peace and order." The notification further said that the District Intelligence Committee Lahore separately said: "There is apprehension that Saeed shall create law and order situation upon release." Additional Home Secretary Mar R Azam Suleman said that the activities of Saeed were "prejudicial to public safety and maintenance of public order". Meanwhile, Saeed on Wednesday filed a fresh application in the Lahore High Court against the latest order extending his detention for another 30 days. Justice Syed Mazahar Ali Akbar Naqvi turned down a request by the home department for holding in-camera proceedings of the petition as the matter was sensitive. The judge adjourned hearing till 2 October. JuD leaders' counsel Advocate AK Dogar had contended the government detained the petitioners on the basis of mere apprehension. He said imprisonment without trial and conviction was prima facie unlawful and unconstitutional. An official of the Home Department presented the latest detention order of the petitioner before the court. He told the court that activities of JuD leaders, if released, would pose a serious threat to the public safety and cause a breach of public order. He said a number of cases had been registered against Falah-i-Insaniat Foundation (FIF), a sister organisation of the JuD, while the detainees also launched a campaign of their political party, which was still not registered with the Election Commission of Pakistan. He said all the law enforcement agencies strongly recommended that the detention of the JuD leader should be extended in the larger public interest. JuD is believed to be the front for the banned Lashkar-e-Taiba (LeT) which is responsible for carrying out the 2008 Mumbai attack. The organisation is accused of involvement in militant activities in India and has already been declared as a foreign terrorist organisation by the US in 2014. The US has offered a $10 million bounty for Saeed for his alleged role in the Mumbai attacks.